Bexhill-on-Sea (often simply Bexhill) is a seaside town situated in the county of East Sussex in South East England. An ancient town and part of the local-government district of Rother, Bexhill is home to a number of archaeological sites, a Manor House in the Old Town, an abundance of Edwardian and Victorian architecture, and the famous De La Warr Pavilion: today a modern-art gallery – which has featured the work of Andy Warhol amongst others – and performance hall, where the likes of comedian Lee Evans and author Michael Morpurgo have appeared. The first reference to Bexhill, or Bexelei as it was originally called, was in a charter granted by King Offa of Mercia in 772 AD. It is recorded that King Offa had 'defeated the men of Hastings' in 771 AD. At this time, the term Hastings would have referred to this whole area rather than the town itself as it does today. In the charter, King Offa established a church and religious community in Bexhill. Norman Conquest of 1066 it appears that Bexhill was largely destroyed. The Domesday survey of 1086 records that the manor was worth £20 before the conquest, was 'waste' in 1066 and was worth £18 10s in 1086. King William I used the lands he had conquered to reward his knights and gave Bexhill manor to Robert, Count of Eu, with most of the Hastings area. Robert's grandson, John, Count of Eu, gave back the manor to the bishops of Chichester in 1148 and it is probable that the first manor house was built by the bishops at this time. The later manor house, the ruins of which can still be seen at the Manor Gardens in Bexhill Old Town, was built about 1250, probably on the instructions of St. Richard, Bishop of Chichester. The Manor House was the easternmost residence owned by the bishops and would have been used as a place to stay while travelling around or through the eastern part of their diocese. There were often disputes between the Bishops of Chichester and the Abbots of Battle Abbey, usually about land ownership in this area. In 1276 a large portion of Bexhill was made into a park for hunting and in 1447 Bishop Adam de Moleyns was given permission to fortify the Manor House. In 1561 Queen Elizabeth I took possession of Bexhill Manor and three years later she gave it to Sir Thomas Sackville, Earl of Dorset. The Earls, later Dukes, of Dorset owned Bexhill until the mid 19th century. Their main residences were Buckhurst Place in Sussex and Knole House in Kent. In 1804 soldiers of the King's German Legion were stationed in barracks at Bexhill. These troops were Hanoverians who had escaped when their country was overrun by Napoleon's French Army. As King George III was also the Elector of Hanover, he welcomed them and they fought as part of the British Army. At about this time, defensive Martello Towers were built along the south east coast, some near Bexhill, in order to repel any French invasion. In 1814 the soldiers of the King's German Legion left Bexhill, eventually playing an important part in the Battle of Waterloo the following year. The German troops had been here to protect Bexhill from the French. However, many of the local people were actively trading with the enemy by way of smuggling. The best known of the local smugglers were in the Little Common Gang and the most famous incident was the infamous Battle of Sidley Green in 1828. It was the 7th Earl De La Warr who decided to transform the small rural village of Bexhill into an exclusive seaside resort. He contracted the builder, John Webb, to construct the first sea wall and to lay out De La Warr Parade. 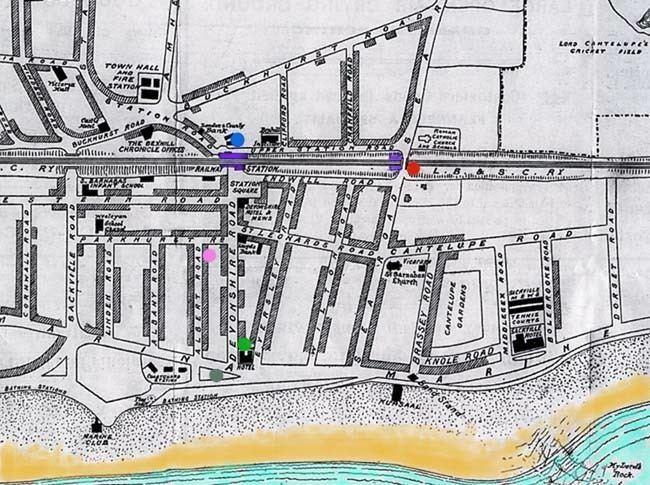 Webb, in part payment for his work, was given all the land extending from Sea Road to the Polegrove, south of the railway line. Opened in 1890, the luxurious Sackville Hotel was built for the 7th Earl De La Warr and originally included a house for the use of his family. In 1891 Viscount Cantelupe, his eldest surviving son, married Muriel Brassey, the daughter of Sir Thomas and the late Annie, Lady Brassey of Normanhurst Court near Bexhill. The Manor House was fully refurbished so that Lord and Lady Cantelupe could live in style as Lord and Lady of the Manor. Finally, the 7th Earl De La Warr transferred control of his Bexhill estate to Viscount Cantelupe. When the 7th Earl De La Warr died in 1896 Viscount Cantelupe became the 8th Earl De La Warr. At this time he organised the building on the sea front of the Kursaal, a pavilion for refined entertainment and relaxation. He also had a bicycle track made, with a cycle chalet, at the eastern end of De La Warr Parade. These amenities were provided to promote the new resort. Meanwhile, many independent schools were being attracted to the expanding town due to its health-giving reputation. The railway came through Bexhill in 1846, the first railway station being a small country halt situated roughly where Sainsbury's car park is today. This was some distance from the village on the hill. A new station, north of Devonshire Square, was opened in 1891 to serve the growing resort. In 1902 the current railway station was opened and a Bexhill West Station was built for the newly built Crowhurst Branch Line. 1902 was the year that Bexhill became an Incorporated Borough. This was the first Royal Charter granted by Edward VII. Bexhill was the last town in Sussex to be incorporated and it was the first time a Royal Charter was delivered by motorcar. 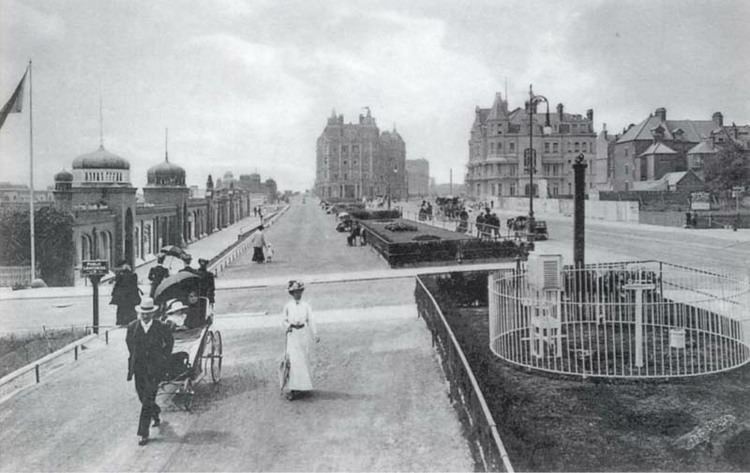 To celebrate the town's newfound status and to promote the resort, the 8th Earl De La Warr organised the country's first ever motorcar races along De La Warr Parade in May 1902. The town was scandalised at this time by the divorce of Earl De La Warr. Muriel had brought the action on the grounds of adultery and abandonment. She was granted a divorce and given custody of their three children. Muriel, with her children, Myra, Avice and Herbrand, went back to live with Earl Brassey at Normanhurst Court. The 8th Earl De La Warr remarried but was again divorced for adultery. He also suffered recurrent and well-publicised financial difficulties. At the start of the First World War in 1914 the Earl bought a Royal Naval commission. He died of fever at Messina in 1915. During local government reform in 1974, Bexhill became part of Rother District Council, thereby losing its Town Council. In its place, Bexhill became a Charter Trustees town, represented by the Bexhill councillors of Rother District Council. A quarterly forum is held to provide a voice to the community at a local level. 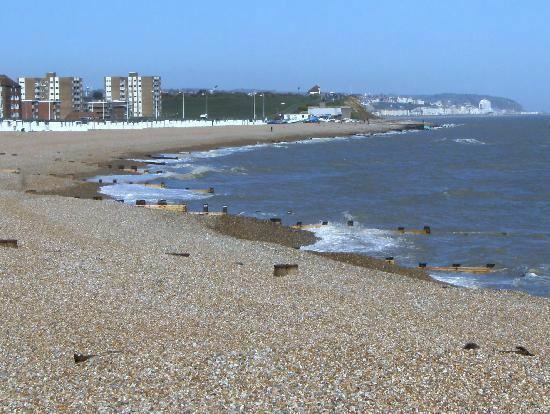 There have been recent plans to recreate a Bexhill Town Council. Bexhill is the home of Rother District Council; District Council Elections are held every four years. Thirty-eight Councillors in total are elected, eighteen of these from the nine wards that make up Bexhill. The council comprises (after the 2015 election and a single by-election in 2016) 30 Conservative, 3 Liberal Democrat, 1 Labour and 4 Independent councillors. The next level of government is the East Sussex County Council, with responsibility for Education, Libraries, Social Services, Civil Registration, Trading Standards, and Transport. Elections for the County Council are held every four years. For these elections, Bexhill is divided into three wards: West (1 councillor), King Offa (2), and East(1). The 2013 East Sussex County Council election resulted in 20 Conservative, 10 Liberal Democrat, 7 Labour, 7 UK Independence, 3 Independent and 2 No description councillors of which Bexhill provided 1 Conservative and 3 Independents. The Parliament Constituency for Bexhill includes the nearby town of Battle. The constituency was created in 1983 and was served by Charles Wardle until the 2001 election, when Wardle left the Conservative party. He was replaced by Gregory Barker, who was the MP until the 2015 General Election when he was replaced by Huw Merriman, the current MP. At the European level, Bexhill is represented by the South-East region, which holds ten seats in the European Parliament. The 2014 election returned three Conservatives, four UKIP, one Liberal Democrats, one Labour and one Green. The most notable landmark in Bexhill-on-Sea is the De La Warr Pavilion. The De La Warr Pavilion is a Grade One listed building, located on the seafront at Bexhill on Sea. The seafront building was the result of an architectural competition initiated by Herbrand Sackville, 9th Earl De La Warr, after whom the building was named. The 9th Earl, a committed socialist and Mayor of Bexhill, persuaded Bexhill council to develop the site as a public building. The competition was announced in the Architects' Journal in February 1934, with a programme that specified an entertainment hall to seat at least 1500 people; a 200-seat restaurant; a reading room; and a lounge. Initially, the budget for the project was limited to £50,000, although this was later raised to £80,000. Run by the Royal Institute of British Architects, this competition attracted over 230 entrants, many of them practising in the Modernist style. Shapes tend towards streamlined, industrially-influenced designs The architects selected for the project, Erich Mendelsohn and Serge Chermayeff, were leading figures in the Modern Movement. The aesthetics employed in the International Style proved especially suited to the building, tending towards streamlined, industrially-influenced designs, often with expansive metal-framed windows, and eschewing traditional brick and stonework in favour of concrete and steel construction. Amongst the building's most innovative features was its use of a welded steel frame construction, pioneered by structural engineer Felix Samuely. Construction of the De La Warr Pavilion began in January 1935. The building was opened on 12 December of the same year by the Duke and Duchess of York (later King George VI and Queen Elizabeth). During World War II, the De La Warr Pavilion was used by the military. Bexhill and Sussex in general were vulnerable if the Germans decided to mount an invasion (Operation Sea Lion). Amongst those who served at the Pavilion during the War was Spike Milligan, later a noted comedian. The building suffered minor damage to its foundations when the Metropole hotel adjacent to the building's western side was destroyed by German bombers. After the War, management of the Pavilion was taken over by Bexhill Corporation (which later became Rother District Council). Changes were made to the building, many of which were inconsistent with the original design and aesthetic of the building. Lack of funds also resulted in an ongoing degradation of the building’s fabric. In 1986, the De La Warr Pavilion was granted a Grade I listed Building status, essentially protecting the building from further inappropriate alteration. 1989 saw the formation of the Pavilion Trust, a group dedicated to protecting and restoring the building. Playwright David Hare notioned that the site be used as an art gallery as opposed to an expected privatised redevelopment. In 2002, after a long application process the De La Warr Pavilion was granted £6 Million by the Heritage Lottery Fund & the Arts Council, to restore the building and turn it into a contemporary arts centre. Work began in 2004 on the De La Warr Pavilion’s regeneration and a transfer of the buildings ownership from Rother District Council to the De La Warr Pavilion Charitable Trust. In 2005, after an extensive programme of restoration and regeneration, the De La Warr Pavilion reopened as a contemporary arts centre, encompassing one of the largest galleries on the south coast of England. A small collection of archival materials related to the De La Warr Pavilion is collected in the Serge Chermayeff Papers held by the Avery Architectural and Fine Arts Library at Columbia University in New York City. The Art Deco and International Style building was designed by the architects Erich Mendelsohn and Serge Chermayeff and constructed in 1935. Although sometimes claimed to be the first major Modernist public building in Britain, it was in fact preceded by some months by the Dutch-influenced Hornsey Town Hall. A Site of Special Scientific Interest lies within the Bexhill district—High Woods. It is of biological importance because it is the only known sessile oak Quercus petraea woodland in East Sussex. Fossils are also commonly found in Bexhill. In 2009 the world's oldest spider web was found encased in amber in the town. It was 140 million years old. In June 2011 it was reported that the world's smallest dinosaur had been discovered at Ashdown Brickworks near the town. A single vertebra was found. Beeches Farm is a Grade II listed building. Central ward: The main part of Bexhill. There are several roads with a variety of shops, a railway station, a library and the De La Warr Pavilion on the seafront. Old Town: The original town on the hill, chartered by King Offa in 772. Sidley: Residential area to the north, with its own high street. Pebsham: A developing residential area to the east of town. Glyne Gap: Easterly low lying land separating Bexhill from Hastings, its most prominent feature is the retail & leisure park. Collington: A residential area near Cooden. Little Common: A small village to the west, with various independent shops. Cooden: In the south-west, plays host to a large hotel, golf and tennis clubs. Barnhorn: An area far west of Bexhill; its name survives in Barnhorne Manor and Barnhorn Road (a section of the A259). The name was recorded in AD 772 in an Anglo-Saxon charter as Berna horna. Reginald Sackville, seventh Earl De La Warr, decided to transform what was then a village on a hill around its church into an exclusive seaside resort, which he named Bexhill-on-Sea. He was instrumental in building a sea wall south of the village, and the road above it was then named De La Warr Parade. Large houses were built inland from there, and the new town began. In 1890, the luxurious Sackville Hotel was built. Bexhill was the location for the first motor race in the United Kingdom, in May 1902. Signs at the town's outskirts have the text 'Birthplace of British Motor Racing' appended below the town's name. The Bexhill 100 Festival of Motoring, held on Bexhill's seafront, celebrated this important milestone in motoring history from 1990 until 2002. This final festival commemorated the Centenary of the original "Races". During the life of the festival, in 1999, the organisers launched the Bexhill 100 Motoring Club, so although the Festival no longer exists, the club still exists, and their committee organises each year, the Bexhill 100 Motoring Club Classic Car Show held on August bank holiday Monday in the Polegrove, Bexhill. The De La Warr Pavilion, brainchild of the ninth Earl De La Warr, opened in 1935 as one of the earliest examples of Modern architecture in a major British public building. It closed for major restoration work in December 2003 and reopened in October 2005. During the Second World War, Bexhill was named as a point to attack as part of Operation Sea Lion by Nazi Germany. The town, like many other English seaside resorts, is now much more a settled community. Although there is a small entertainment area on the seafront, it now has a large retired population, like much of the south coast. The last remaining cinema was sold to the Wetherspoon pub chain on 1 December 2014. A small group of residents, and Eddie Izzard had been fighting to save the cinema for the last five years but the group failed to raise the necessary funds. The town is served by the coastal railway line between Ashford and Brighton and has three railway stations, including Cooden Beach, Collington, and Bexhill. Regular trains run to Brighton, Ashford and London. Bexhill is served by 13 bus routes including school routes which serve the surrounding areas like Hastings, Battle, Conquest Hospital, Eastbourne and Pevensey Bay Asda (Free bus on Wednesday's). The area with the most bus services is between Sidley & Bexhill which has the route 2 (Asda free bus), 95, 97 & 98. The railway built by the Brighton, Lewes and Hastings Railway (later part of the London, Brighton and South Coast Railway) arrived on 27 June 1846, although the present station was not built until 1891, when the town had become popular as a resort. A second line, this time built by the South Eastern Railway and approaching the town from the north, was a branch line from Crowhurst via an intermediate station at Sidley to a terminus at Bexhill West. The line opened on 1 June 1902 and closed on 15 June 1964. The branch was also closed temporarily between 1 January 1917 and 1 March 1919 as an economy measure during the First World War. Bexhill-on-sea has two Non-League football clubs Bexhill United F.C. who play at The Polegrove and Little Common F.C. who play at the Recreation Ground. Bexhill-on-Sea Golf Club (now defunct) was founded in 1890. It closed at the time of WW2. Bexhill on sea is also the home of Rother Swim Academy, offering swimming lessons to children. Founded in 1990 and family run. Marina Court Garden officially opened on 6 July 2015 with the Bexhill Rotary Club Wheel Coin collector (Bexhill Observer).The open space on the Marina, next to the De la Warr Pavilion will provide an area to sit and relax. Rother District Council Chairman opened the Garden and President Raouf Oderuth of Bexhill Rotary Club unveiled the Coin Collector. The proceeds will fund local nominated Charities. Hertha Marks Ayrton, An engineer, mathematician, physicist, and inventor who was awarded the Hughes Medal by the Royal Society for her work on electric arcs and ripples in sand and water. John Logie Baird, Scottish inventor of television, resided in a house by the station towards the end of his life. Michael Cowpland, founder of high-tech companies Mitel, Corel, and ZIM, lived in Bexhill and went to Bexhill College until he was 18. Fanny Cradock and Johnnie Cradock, chef-broadcasters, lived in Cooden Drive, Bexhill. Eddie Izzard, comedian, spent some of his childhood years in Bexhill-on-Sea. Peter Katin, concert pianist, recitalist, chamber musician, and concerto soloist, has made Bexhill his home. Sir Philip Ledger (1937–2012), classical musician, choral composer and scholar, was born in Bexhill. Desmond Llewelyn, the James Bond actor who played Q, lived in the town until his death in 1999. Ted Lowe, commentator on BBC's 'Pot Black', which brought snooker to prominence on British TV, was a longtime resident of Bexhill until his death in May 2011. Kate Marsden FRGS (1859–1931), nurse who travelled through Siberia helping Yakut lepers, lived in Bexhill in the 1910s and became a founder of Bexhill Museum. Spike Milligan was stationed in Bexhill while in the army during the Second World War, and most of the first volume of his war memoirs takes place there. Indie-rock band Mumm-Ra came from Bexhill. The topic of their hometown frequently came up in interviews. Graham Norton, Irish actor, comedian and television presenter, lives in a contemporary house in the Cooden Beach area. Ronald Skirth (1897–1977), conscientious objector and author of the First World War memoir The Reluctant Tommy, grew up in Bexhill and describes it at length in his book. Eric Slater (1896–1963), English artist and printmaker, lived in Bexhill and created images of the surrounding countryside. Leslie Weatherhead, renowned preacher and theologian, retired to Bexhill.